← How I learned to stop worrying and love the exercise. My favourite thing to have when we go out for indian food. So refreshing, so tasty. They are really tasty anytime of day. Do I really even have to mention how good yogurt is for us? Watch tv, even Jamie Lee Curtis tells us so. 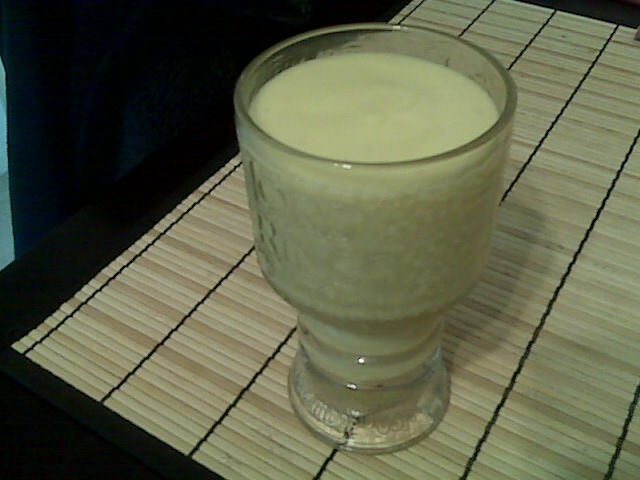 Yet again, I dragged out my Lord of the Rings cup of awesome to have a mango lassi today. Been wanting one since this tasty indian restaurant commercial graced my tv screen the other day. A well deserved treat for not running out and getting some chicken korma. Sadly, my mint that is currently growing is having issues so I had to keep my sprig farming to a minimum. No mint garnish for the picture. Place everything except the mint in the blender. Sometimes I like to add some to the blend but that is purely optional. I recommend chocolate mint if you can get your hands on it. Tasty! You usually have to raid the garden stores early to get your hands on one to grow. Makes four servings. Each serving is 196 calories, .5 grams of fat, and 2 grams of fiber. A bit decadent for a drink I know but considering how thick and tasty it is you can chalk it up as one of those snack drinks. It’s certainly lower in fat and calories than most shakes you will pick up…and a whole lot better for you. Hurray for the mango lassi! I should make some curry to go with this sometime. This entry was posted in Beverages and tagged mango, yogurt. Bookmark the permalink.